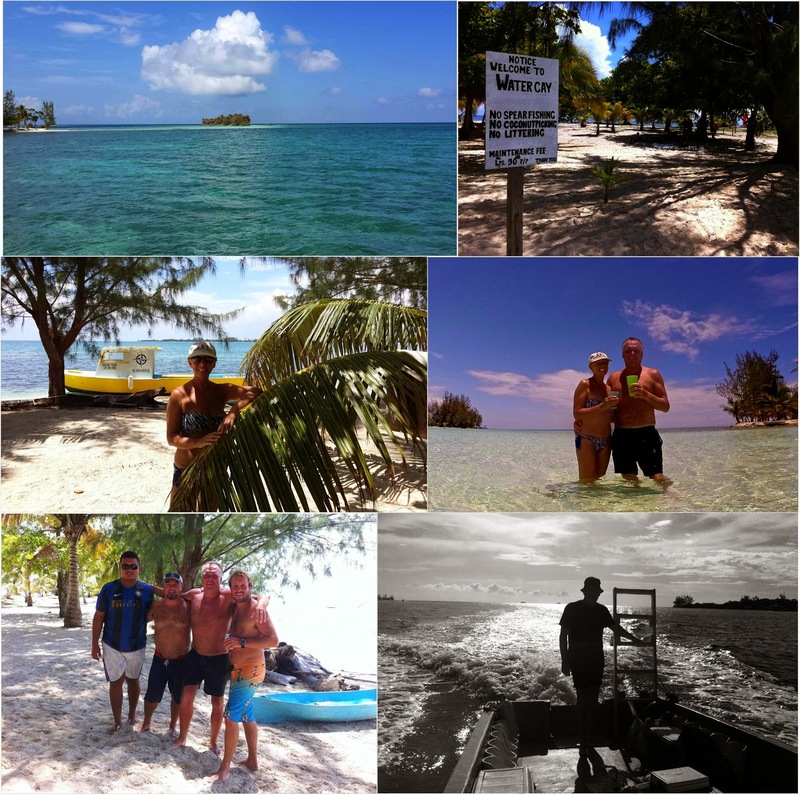 August was our second month spent here on Utila, a tiny Caribbean island off mainland Honduras. It has been a much quieter and more laid back month than July – when there was the island carnival and music festival. It also feels much hotter, not so much because the temperature has risen but because the wind has dropped. We no longer get that wonderful easterly breeze rushing through our Little Yellow House cooling us down, and there have been nights when we have succumbed to the high price of the electricity and used the air-conditioning for an hour or two - when the island’s electric power supply is on that is – and it’s off far more than it’s on! 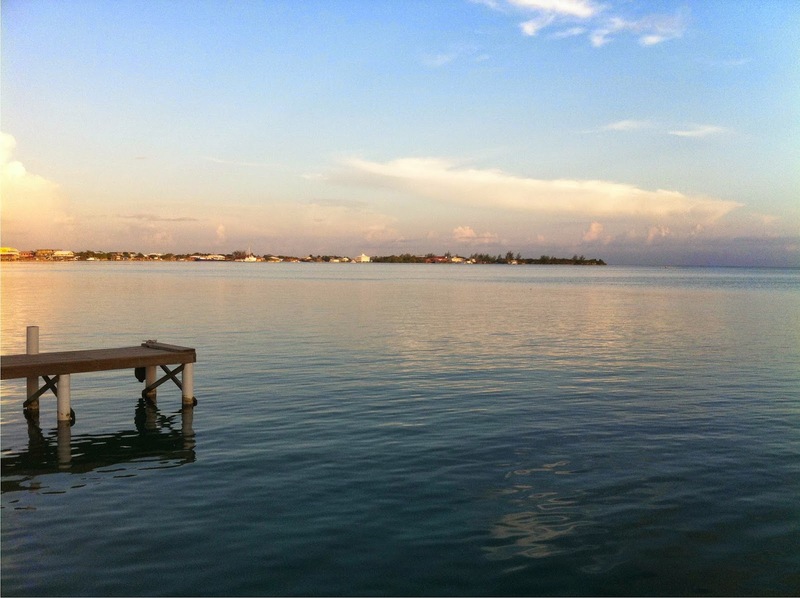 August on Utila - everything is calm and the sea is like a translucent blue mirror. In August and in September all the divers on the island get excited because the increased temperatures and the calm waters brings the whale sharks close to the reef and to the island. Whale sharks are the biggest fish in the sea and my lovely husband Trav was at last able to achieve his dream of swimming with a magnificent whale shark this week! Now, it doesn’t look like it from all the fun photos I have to show you this month, but I promise you that I have been working very hard too - writing and researching my new novel ‘Castaway in the Caribbean’. So far I'm on target and I'm on schedule! Despite what it looks like - I have been working hard too - honestly! So as we go into September I’m very aware of how fast our time here is flying by - and I still have so much I want to do - both on the novel and also on the island. So when I'm not actually sat down writing, you'll find me out and about researching. As boats feature heavily in my story, I've been particularly interested in looking at boats and going out in them, all in the name of research! We still take a Thursday off work to have some fun together and we usually go to our favourite beach. Sometimes we have the whole place to ourselves to sunbathe and snorkel on the reef and other times we meet up with lovely friends for lunch and drinks - and deck jumping! Jumping off the deck at Coral Beach! 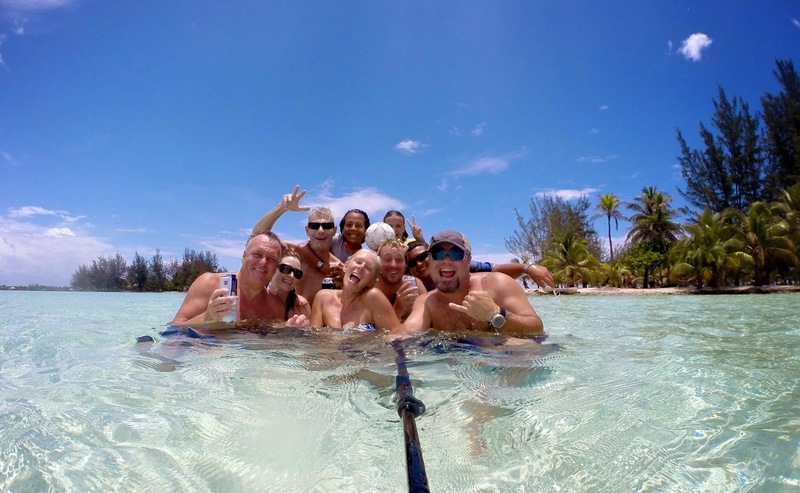 This month we had another fabulous day out on the boat with the lovely peeps at Ecomarine Dive Center. Last month we were diving and snorkeling and we stopped for lunch at an island called Pigeon Cay. This time we took a Sunday picnic to an island called Water Cay. The Cays are a string of tiny, mostly uninhabited, tropical islands off the coast of Utila. It was wonderful to spend a whole day relaxing on the white sand under the shade of the palm trees or laying in the shallow and incredibly warm water sipping rum! Then after all the highs there was a bit of a low point to the month when Trav and I both came down with a horrible tropical head cold. I got cold sores on my mouth and Trav had to stop diving for a couple of days as his ears wouldn't equalise. But the worst thing was that I then had a nasty re-occurrence of the tooth abscess that I first got during our trip to South Korea a few months ago (see my previous post on South Korea). You see, I just didn’t have time between that trip and this one to have the tooth properly crowned, so the flare up wasn’t totally unexpected, but it was very unwelcome non-the-less. I took a course of the antibiotics that I brought with me in our medicine kit, and I hope that will keep the problem in check, until we get home on the 1st October and I can get a proper dental check up. 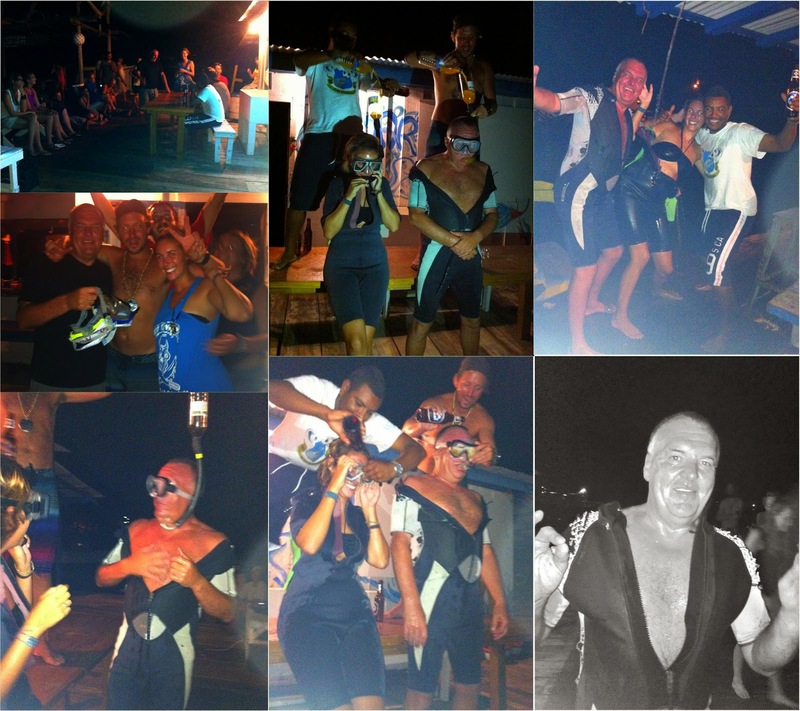 The big highlight of the month came right at the end – with Trav’s graduation party and snorkel test. He graduated as a Dive Master as the same time as a lovely lady called Cat, who is also from the UK. It’s tradition for the graduating Dive Masters to put on entertainment – which usually involves them getting their own back on their Instructors! Trav and Cat put on a fun version of the UK TV show ‘I’m a celebrity – get me out of here!’ except theirs was ‘I’m a PADI Pro – get me out of here!’ The PADI Pro’s had to answer crazy questions and were rewarded with shots of rum if they got them right. Particular fun was had at the ‘Reef Tucker Trials’ when Fish Lips, Moray Eyes, Fire Worms and Squid Balls had to be eaten! The final part of the night involved the graduates having to earn their Dive Master T-shirts by doing the famous ‘Snorkel Test’. This involves rum being poured into a mask and snorkel and it being drunk through the nose and mouth. Trav has been saying for weeks that he wasn’t going to do the test but in the end he was persuaded otherwise. But to make Trav’s test more embarrassing for him, his instructor made him wear a far-too-small wet suit throughout. The whole night was great fun and I’m so proud of my Dive Master husband! Dive Master Graduation Party and Snorkel Test! September is going to be a very busy time for us here on Utila. I still have to work hard on finishing ‘Castaway in the Caribbean’ and Trav will be working at the dive center as a fully qualified Dive Master. On top of that there will be the island's Independence Day celebrations mid-month. During the next few weeks, Trav and I will have to make even more time for having fun together, in order to fully appreciate the time we have left on Utila before we suddenly find ourselves back in Scotland; at the start of what will be wintertime. I’ll try to post some writing updates during September and maybe some sneak snippets from the chapters I have written, albeit unedited, until my lovely editor gets her hands on the manuscript. I’ll also do another monthly round up at the end of September before we travel home. In the meantime don’t forget that you can find me on Facebook and on Twitter. Do please feel free to leave a comment - I so love to hear from you - and do come back soon! I'm living vicariously through your blog posts. You and Trav are having such an amazing time. Thanks Melanie - yes, we are having an amazing time here but the days are flying past so quickly now. I'm concentrating hard on getting Castaway in the Caribbean finished before the end of the month and when we have to fly back to the UK. Just a few chapters to go now! Sounds idyllic, Janice! Can't wait to read Castaway. We've been busy too--our daughter got married in July (in San Francisco); our son is being married in New York next month and the newlywed daughter is already pregnant! Plus, the third and final book of the Legacy series, Legacy of Love, was published last week. Phew. I need a vacation! Care to switch places? Hi Harriet! A wedding in San Francisco and then a trip across country to a wedding in New York sounds wonderful! Congratulations on your impending grandparent status - I'm in the same position myself and feeling thrilled as well as shocked - as surely we are far too young to be grandmothers? !